This is an excellent tool for quickly and easily scheduling out content over multiple social platforms. You get a clear view of how your content will be posted so you can be confident in the published product prior to posting. I've found the mobile app less appealing than the desktop platform so I would recommend using this mainly on desktop in the office. 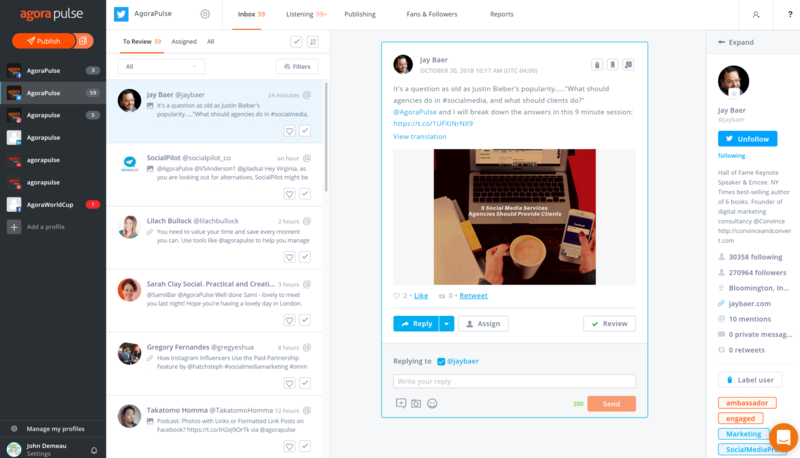 My favorite feature is the ability to schedule a post to multiple platforms (i.e, Facebook, Twitter and LinkedIn) within one screen, but with the added bonus of being able to tweak each platform's post. That means custom URLs w/unique UTM codes, adjusted post length for different platforms, etc. A terrific feature. The content queues are also wonderful. They allow me to find and distribute evergreen content at custom intervals without having to "reschedule" each time. Simply load up the content into a queue, set the days/times for each queue, and how many times you want that content to recycle and BOOM you're done. Beyond that, they're always improving the platform. Each week some tweaks are made, which are announced in a blog post. The customer service is top notch, and they're humans -- meaning they're not just copying & pasting from a script, but they have personality and they listen. This goes a LONG way, and makes it easier to be patient with features that might not yet quite be there, or when there's an issue or unexpected change to an API that affects the platform. I'd like to see support for Instagram Stories. In addition to the calendar view, I'd like to be able to see scheduled Instagram posts in a 3x3 grid view. This would make planning much easier. When creating a new post, it would be nice to have a way to edit photos after uploading. Even just a simple crop option would be amazing, especially for Instagram. The calendar can be a little buggy at times if you try to drag and drop multiple posts into different spots too quickly. A simple page refresh always solves the issue, so it's not a big deal. I'd like to be able to track the performance of LinkedIn posts. AgoraPulse meets all our needs and requirements for a social publishing and listening tool. Simple to use, beautiful design and excellent reporting. Mention works quickly and its user interface is easy to use. Alerts update regularly and I've never noticed any lag. It integrates with our CRM via Zapier, but this is not something which we use yet. The only thing I would say is that it takes time for Mention to reach its full potential. It only starts to rank influences from when you set up the alert, so it can take a few weeks to build a map of your influencers. It's just excellent all around. Everyone is friendly and professional. Everyone seems empowered to make decisions and get things done. The communication is great. I tried a few similar tools before I discovered AgoraPulse. Buffer and Post Planner are both good at what they do but ultimately fall short for managing multiple clients. Granted, they're also more affordable - great if you need something simple and you only have a few personal profiles to manage. I also tried Hootsuite, but it's just not for me. I'm sure it's a great tool for many, but I find it needlessly complex with a clunky interface. It's not nearly as intuitive as AgoraPulse, and quite frankly it's just not a good value for small and medium-sized agencies. We only use Mention as an add-on component to other monitoring services to catch any mention that might have not been seen by the others. We have lowered our internal capacity. 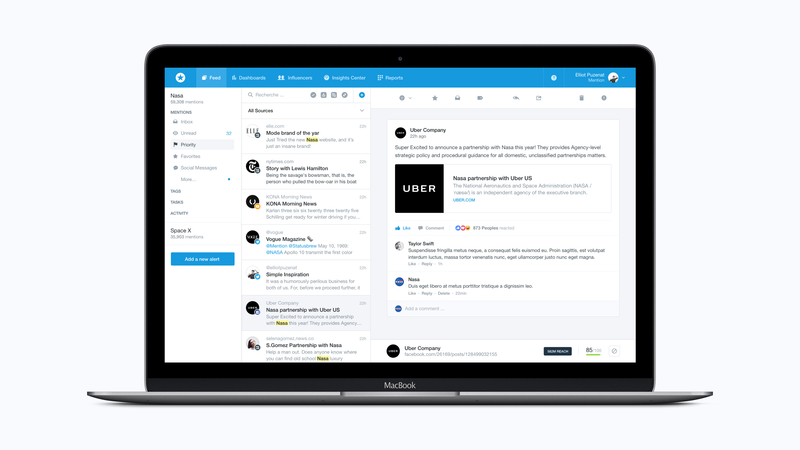 Our inbox captures incoming conversations for each social profile. Get CRM data on those sending you messages. Send them a saved reply or assign the conversation to a teammate.